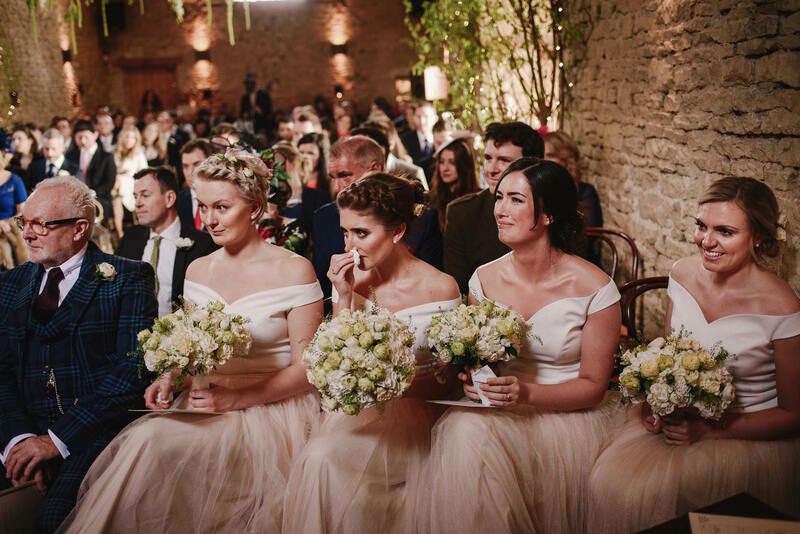 Sophie and Luke's beautiful flower filled Cripps Barn Wedding Flowers - Joanna Carter Wedding Flowers | Oxford, Oxfordshire, Berkshire, Buckinghamshire and London. 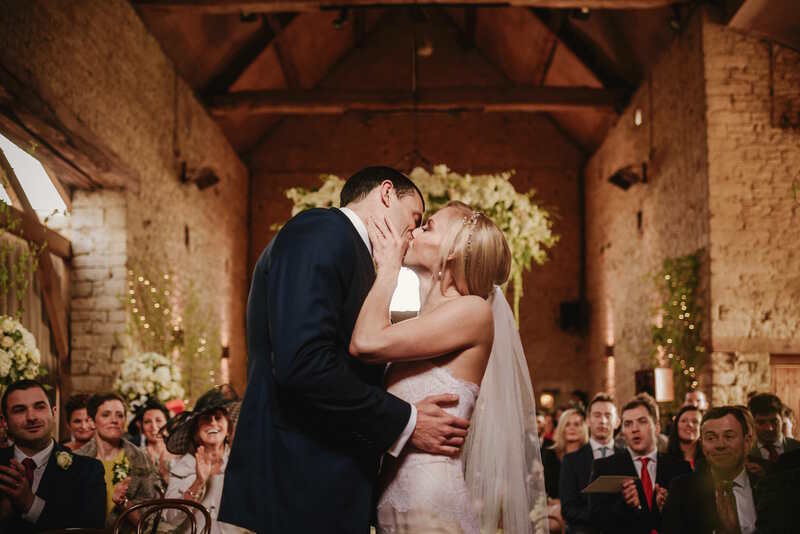 Sophie and Luke’s wonderful flower filled wedding back in March started our 2016 wedding season in the most amazing way! 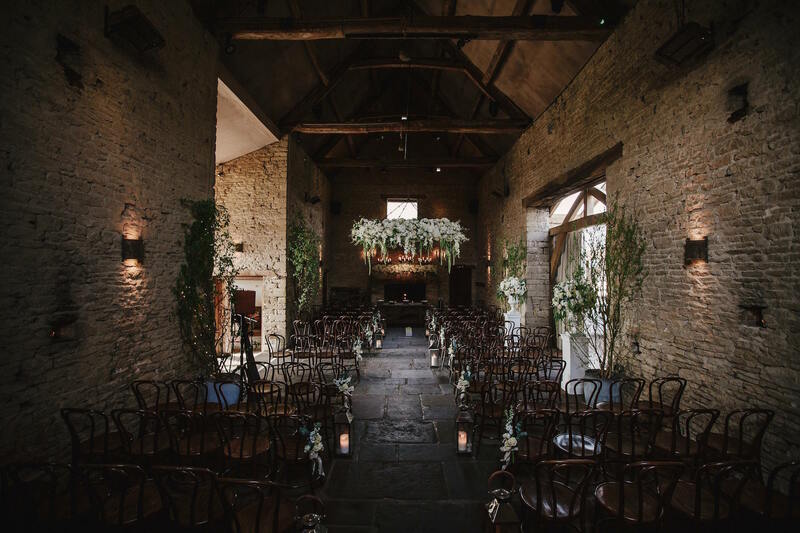 They got married at Cripps Barn in Bibury, which was a new venue for us to work in, but one that we instantly adored. 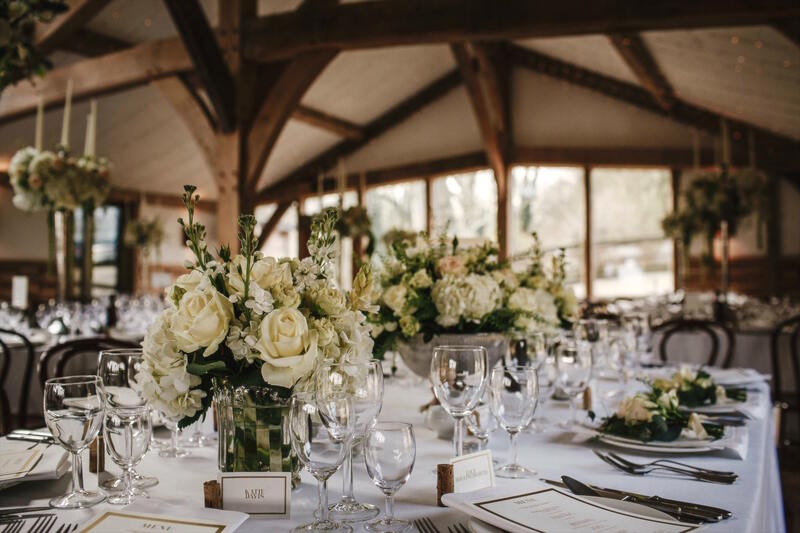 Sophie and Luke both wanted their flowers to be really impactful and to make the day really special which was wonderful for us as we were able to make some stunning large scale arrangements to wow their guests. 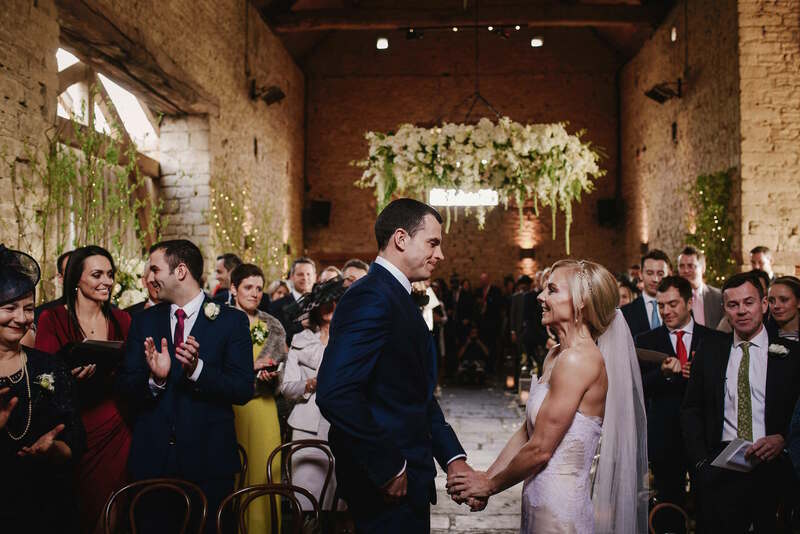 The colour scheme for the day was ivory, cream and a very subtle accent of peach which worked brilliantly against the stone walls and wooden beams of the barn. We were lucky enough to have the wonderful Andy Gaines taking the photos and he captured the whole day perfectly. ( www.andygaines.com). 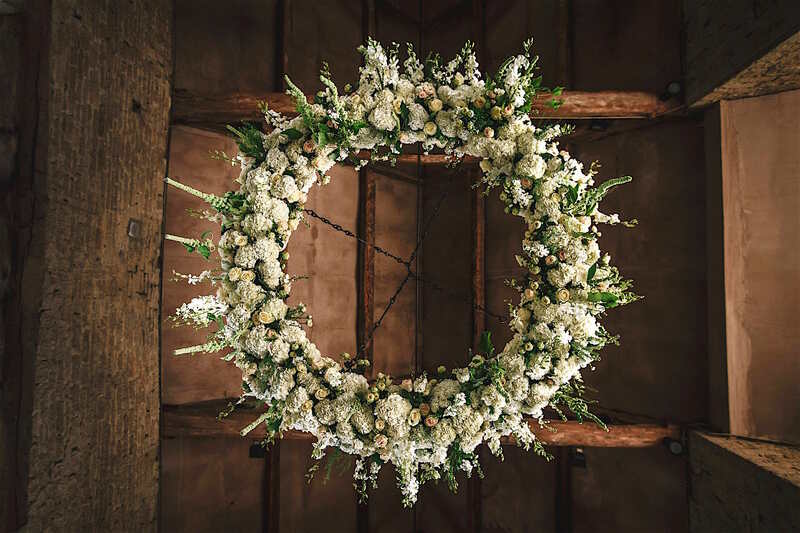 The most striking piece of the day was the 18ft circumference ceiling garland that hung above the ceremony room. It was a brilliant piece to work on filled with hydrangeas, roses, stocks, amaranthus and orchids. Just lovely! 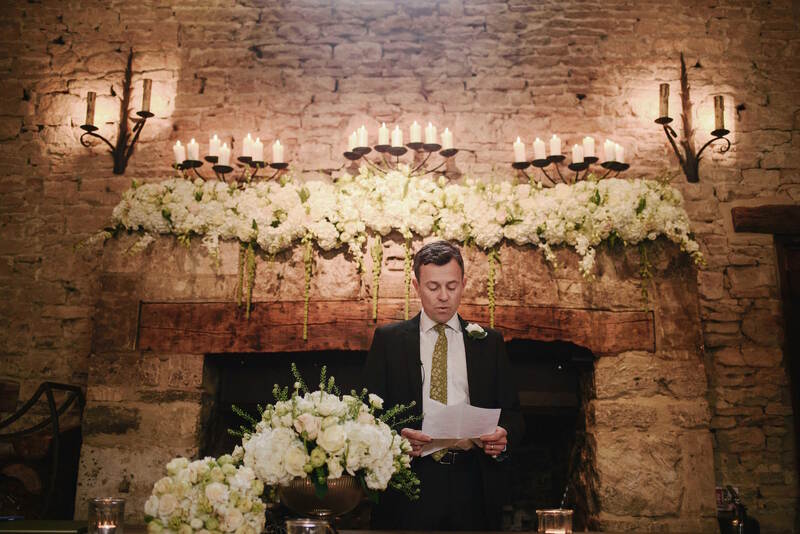 The ceremony room had a deep mantelpiece behind the Registrar’s table that we covered with a long garland that sat in front of the venue’s tall candelabra. We placed a silver rose bowl on the ceremony table and tall glass and silver lanterns in the aisle with petals scattered in between. 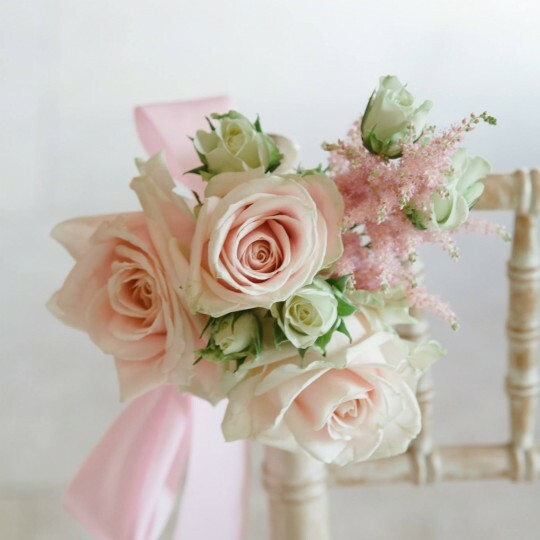 We tied bunches of stocks and roses to the aisle end chairs. 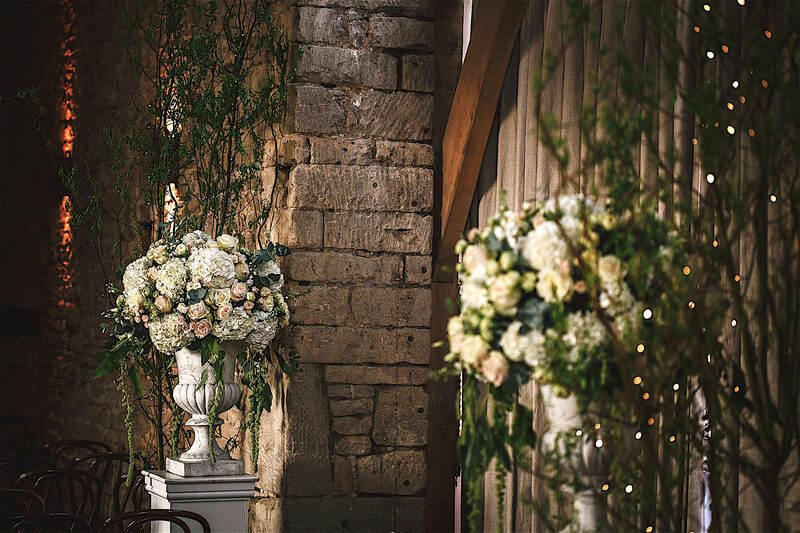 At the doors to the reception room we placed large ivory urns topped with arrangements of roses, hydrangea, stocks, amaranthus, orchids and spray roses. 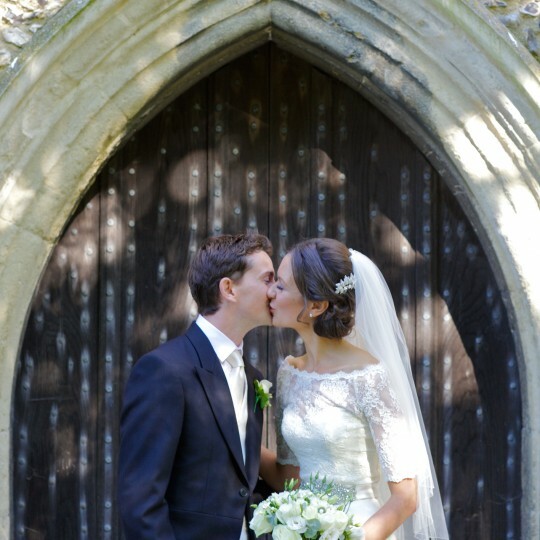 Sophie wore an absolutely stunning fishtail lace dress and looked truly beautiful. 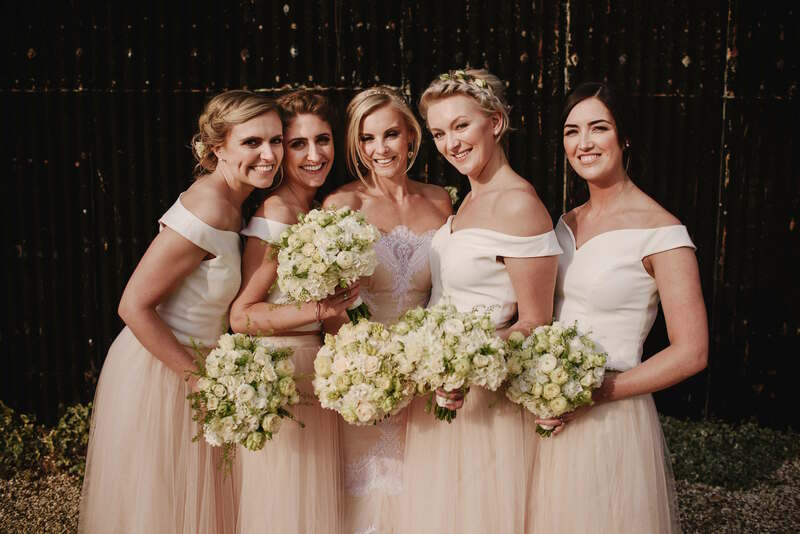 Her bridesmaids wore two piece outfits with full tulle skirts. The colour of their skirts echoed Sophie’s dress perfectly. Sophie carried a bouquet of white hydrangea with hyacinths, spray roses and white ranunculus. It was a lovely combination of textures and shades and worked beautifully with her dress. For the bridesmaids we made slightly simpler, smaller versions of Sophie’s bouquet. They all looked absolutely stunning. 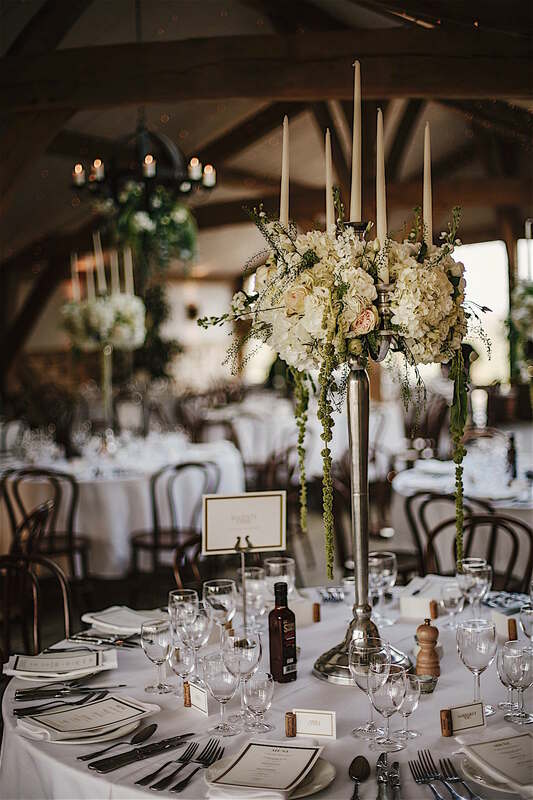 For the reception we placed tall silver candelabra on each table which was topped with a loose ball of flowers. On the top table we added a silver rose bowl with smaller vase arrangements either side of it. 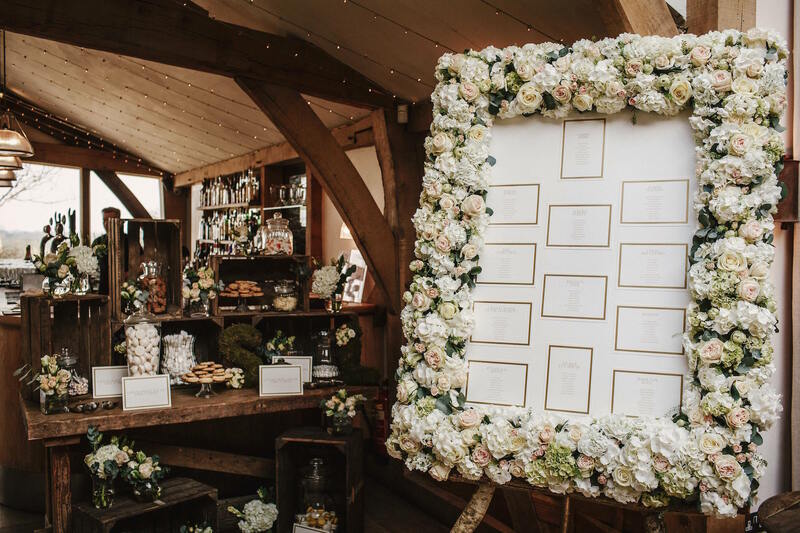 The table plan had a stunning thick garland of flowers around the edge and even the sweetie table was adorned with small vases of flowers. 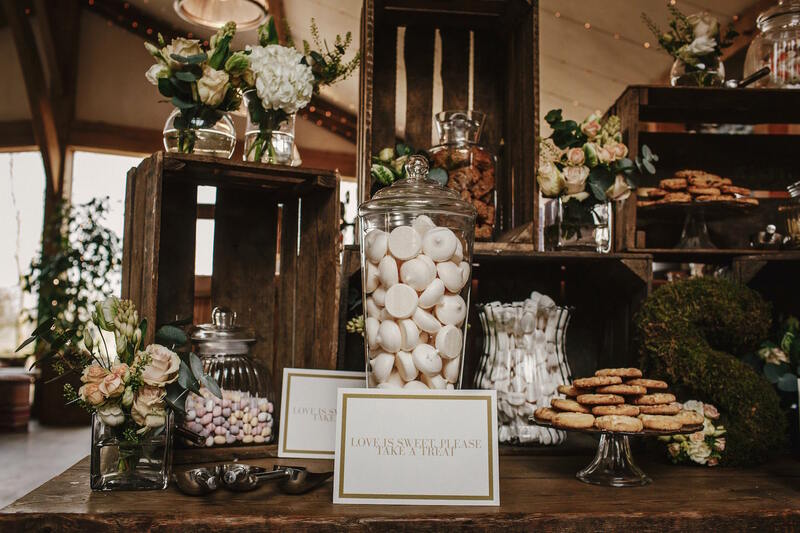 We used vintage apple crates and mixed vintage style vases and cake stands to display the sweets and then dotted the vases in between. It was such a privilege to work on this wedding. 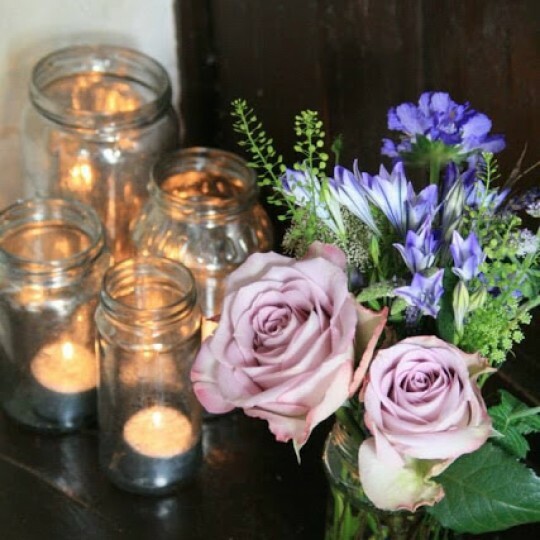 Sophie and Luke were wonderful clients with a real love of flowers and they asked us to make such lovely arrangements for them. 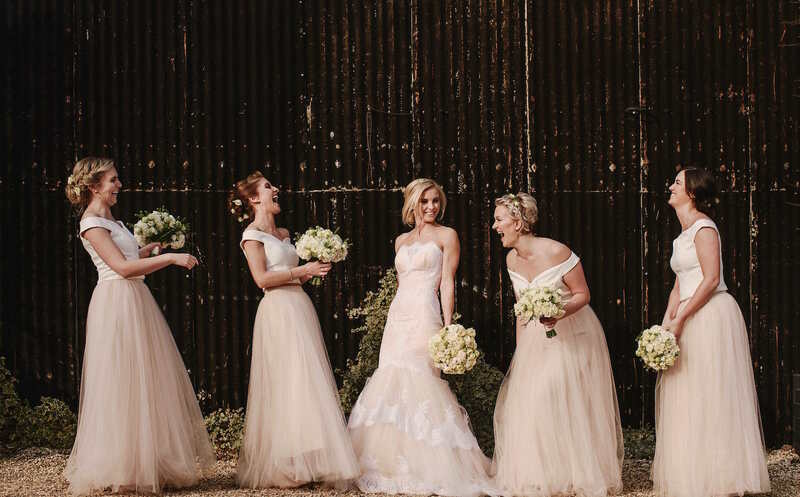 We had a great time exploring this new venue which was the perfect backdrop for the flowers. 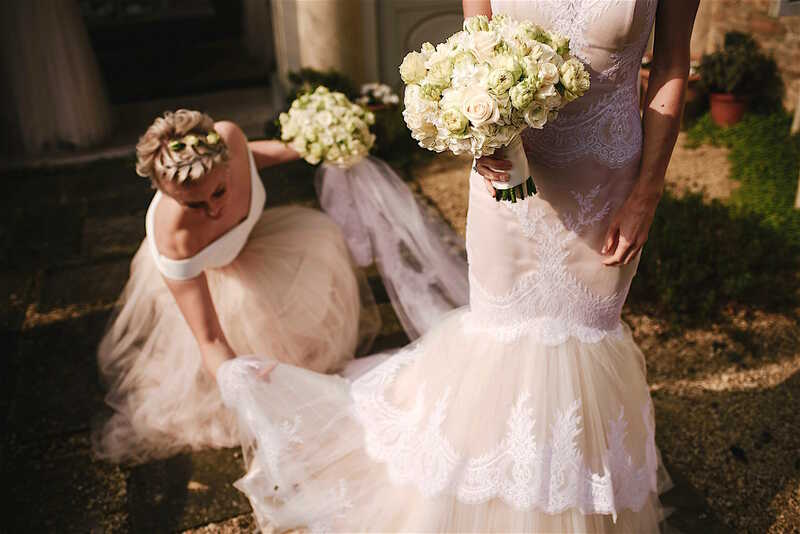 We loved every minute of this wedding and couldn’t wait to show off the photos!